The Bible is crystal clear: the Lord Almighty will judge all nations who divide the Land of Israel. Nevertheless, international pressure on Israel to carve up the Holy Land like a Thanksgiving turkey continues to build following President Obama’s May 2011 speech calling for Israel to withdraw to the 1967 borders. Nearly every world leader — and certainly every American president since the Six Day War — has demanded Israel give up significant amounts of territory within Judea, Samaria, and the Golan Heights in order to create a sovereign Palestinian state and make peace with Syria, but never this much territory. The Obama plan would force Israel to give it all up, to divide Jerusalem, and return to indefensible borders. This would be a grave error. It would severely jeopardize Israeli national security. It would do so in direct defiance of the Holy Scriptures. And it would draw the judgment of the Lord Almighty against the United States and all other countries involved in the process. Historically, we know that the nations have repeated divided the Land of Israel. Prophetically, we know they will continue to do so until the Day of the Lord comes. We cannot necessarily stop our countries from making foolish errors of Biblical proportions. But we can loving, gently, but firmly and clearly warn them. And we must. That’s why at The Joshua Fund’s 2011 Epicenter Conference, I taught the last chapter of the Book of Joel, focusing specifically on the implications of this passage warning the nations. You can watch that message and the others at www.epicenterconference.com. Today, I am also posting the notes from my message at the conference. I hope you find them helpful. For Part 1 of my notes on this series on the Book of Joel, please click here. For Part 2 of this series on the Book of Joel, please click here. For Part 3 of this series on the Book of Joel, please click here. For Part 4 of this series on the Book of Joel, please click here. For Part 5 of this series on the Book of Joel, please click here. The Book of Joel is a wake up call and a trumpet call to Israel and the Church. It is also a message of warning to the nations – and a very sobering message at that. Joel 3:1 – “in those days and at that time” – what time? Some of these are atrocities that various nations and empires have committed against Israel and the Jewish people over the centuries. Yet some of these are atrocities that will be committed against Israel and the Jewish people during the “time of Jacob’s troubles” (Jeremiah 30:7), also known as the Tribulation. The good news is that Joel tells us a day of reckoning is coming….the Day of the Lord is coming….surely it is near. The Hebrew Prophet Joel gives us a great hope…that God is sovereign and He will reign from this city and make all things new and beautiful by His grace and power. There is so much richness to each and every verse of chapter three. I’ve taken most of the last year to study it and I’m still finding treasures I didn’t see before. But given the moment that we are in I want to focus on verse two. Consider these words carefully and completely….and let the United Nations be warned….let the United States be warned….let the European Union be warned….let the Arab League be warned….let the Palestinian Authority be warned….let Hamas be warned….let the Government of Israel, too, be warned. It may look like a brilliant idea to divide the City of Jerusalem….to divide Judea and Samaria – a.k.a., the West Bank – away from the State of Israel….to give away the Golan Heights….as it seemed brilliant to some to give away the Gaza Strip in 2005….but let there be no mistake: the Word of God warns us in no uncertain terms that judgment is coming for all who divide Israel….and divide Jerusalem….and scatter, oppress and mistreat the Jewish people. As I say this, the United Nations is preparing to hold a vote in the next few months to divide Jerusalem and the rest of Jerusalem and unilaterally declare a sovereign Palestinian state. For many, this seems wise and fair and just…..but willfully disobeying the Word of God is never wise….never fair….never just….and it comes with consequences. I recognize that these Scriptures can be difficult for many Palestinian Arabs and many Israeli Arabs to read and accept, especially if they are Muslims and nominal Christians without a personal relationship with Christ….but even if they are born again brothers and sisters in the Lord. Most Palestinians long for a sovereign state of their own…many have been deeply hurt during the rebirth of the State of Israel and throughout the past 63 years….I am sympathetic with this pain and this longing. The Bible indicates that Jews would be a sinful people when they return to the Land in the last days. Only after they return, the Bible teaches, will the Holy Spirit be poured out upon the Jewish people in an increasingly significant way (Ezekiel 39:29 and Joel 2:28-32 — or Joel chapter 3 in Hebrew Bibles). Only then will a growing number of Jewish people will repent and return to a personal relationship with the Lord. Jesus said in Matthew 24 and Luke 21 that there would be “wars and rumors of wars” and “revolutions” and “lawlessness” in the last days. Certainly, the rebirth of Israel — while prophetic and God-ordained — has come with wars, rumors of war, revolutions, sins, and even crimes committed by some Arabs as well as some Jews. The Bible doesn’t teach this period of the last days will be easy, and the Bible is right…..that said, while these are painful facts, they are facts nonetheless…..and each one of us must be true to the revealed Word of God….we do not please the Lord — or do our Arab brothers any favors, or do the nations any favors — if we ignore, deny or try to explain away the plain meaning of these verses, that Israel would be prophetically reborn and the Jews would come back to the Land that the Lord promised Abraham, Isaac, Jacob and their descendents. Genesis 12:1-3 tells us that the Lord will bless those who bless the children of Abraham, and He will curse those who curse the children of Abraham. Those who have cursed Israel have, sadly, found themselves facing great pain and suffering. Those who have tried to divide the Land again and again have found themselves both causing but also experiencing great pain and suffering. For many, these are not easy truths to hear or to hold…..but God in His love and fairness puts us on notice that there are consequences to rejecting these truths. First, how we communicate Biblical truth – how we say what we say in light of the Word of God – matters to God. Second, how we live out Biblical truth – how we do what we do in light of the Word of God – also matters to God. What do I mean? Allow me to explain. First, our communication — consider John 12:49 (NIV), where Jesus said, “the Father commands Me what to say and how to say it.” What we say matters to God….but so does how we say it. It’s not enough just to communicate what is Biblically true….we must also examine how we communicate it….are we speaking the truth in love?….are we being gentle?….are we being humble? Yes, the Day of the Lord is coming….Yes, God is going to bless and save the nation of Israel….Yes, the nations are going to be judged for dividing the Land and shedding Jewish blood and for committing atrocities against the Jewish people….These are truths….they are from the Lord….they are just and true….But we must be careful in how we communicate these truths because they are so difficult for so many to hear…..especially our Arab brothers and sisters….Let us be wise and humble and respectful in how we teach what we teach lest we inadvertently sin with our callousness or insensitivity….lest we cause additional pain or even create a new stumbling block to our listeners being able to hear and truly receive the truth. Second, our actions — Are we living out the fullness of the implications of Biblical truth, especially when it comes to the Book of Joel? Today, those of us who believe in the Abrahamic Covenant that God gave the Land of Israel to Abraham, Isaac, Jacob and their descendants as an “everlasting possession” and who agree with the Apostle Paul that “the gifts and the calling of God are irrevocable” (Romans 11:29) are at risk. At risk of being outflanked on the justice issue….at risk of being – and/or being perceived around the world as being – insensitive to the charges that we are blind to or callous towards injustice suffered by the Palestinian people….“Justice” can be a politically loaded word…..and it can be wielded for unscriptural ends. But it is a Biblical word….it is an important word….and we must embrace it and passionately pursue its true Biblical meaning. Again, this does not mean the Land should be divided…That does not mean a sovereign Palestinian state should be created….It does mean that followers of Jesus Christ should care about justice and mercy – for the Jews and for the Palestinians, and for all of Israel’s neighbors who are suffering in this fallen world….After all, while the Bible clearly explains that the Lord will bring the Jewish people back to the Land of Israel and allow them to reclaim their God-given ownership of the Land, nowhere in the Bible are Jews (or any group of people) given a license to commit injustice. In addition to praying for Jews and for the Palestinians…. In addition to seeking real and practical ways to bless Israel and her neighbors in the name of Jesus…. In addition to providing food, clothing, medical supplies and other humanitarian relief to the poor and needy on both sides of the security fence….of caring for widows and orphans….of caring for Holocaust Survivors and victims of war and terrorism….We need to make sure everyone from Tel Aviv to Tehran hears the good news of God’s amazing love and grace as revealed through Jesus Christ. Let those of us who love Israel also love Israel’s neighbors and enemies enough to make sure they hear the gospel….to strengthen the Church in the Arab and Iranian world….to help them train pastors and plant churches and fulfill the Great Commission. Precisely because the Day of the Lord is coming….surely it is near. President Obama’s plan to precipitously start drawing down U.S. military forces from Afghanistan before the war against Radical Islamic jihadists has truly been won – and doing so against the advice of some of his field commanders — is a serious mistake, misguided and dangerous. The move is a sign of White House fatigue. It will be perceived by our enemies as weakness. It will embolden the enemy and put more Americans, Israelis and other Mideast allies of ours at greater risk. We should be letting Gen. Petraeus and his team — including the in-coming commander, Lt.-General John Allen, who will take over when Petraeus moves to head the CIA — finish the job and only then bring the troops home. Such preparations are critically important. But much more is needed. Israeli leaders are not calling the nation to prayer, fasting and repentance, despite the Biblical admonition to do so. Talk is cheap. In a time when economic, religious and geopolitical threats are rising….a time when so much of the world is turning against God…a time when so many have forgotten God in their daily lives….a time when so many think the Church is irrelevant and/or hypocritical….and a time when many have turned against Israel and God’s Chosen People, what we need are leaders at every level of society who are serious about crying out to the Lord for mercy and redemption. I’m not talking about a bunch of religious hot air — slogans, bumper stickers or platitudes. What we desperately need is a bold and sincere and solid and revolutionary faith that moves us to action, that moves us to know God more deeply and serve Him more faithfully before the Day of the Lord arrives. As we read in the New Testament Book of James, “faith, if it has no works, is dead” and “faith without works is useless” (James 2:17 and 20). This one of the reasons I love the Old Testament Book of Joel and why I’m grateful we studied it together at the 2011 Epicenter Conference — because it is a powerful call to action. Skip Heitzig, a dear friend and senior pastor of a wonderful Bible-teaching congregation of some 14,000 people in New Mexico, taught at the conference on Joel 2:18-32 (Joel 2:28-32 in English is actually divided as Joel chapter 3 in the Hebrew Bible) and did a powerful job. I would encourage you watching his message — and the other messages — for free on-line. Today, I’m posting Part Four of my personal study notes on the Book of Joel. I hope you’ll find them helpful as you seek a faith that changes your life and moves you to serve the Lord with more passion and conviction than ever before. The bad news: the Scriptures are clear that a terrible time of judgment and devastation is coming, worse than at any other time in human history. The good news: The Scriptures are also clear that when individuals repent and return to the Lord – and by God’s grace when the nation of Israel repents and turns back to the God of Abraham, Isaac, and Jacob – then…..
“And it will come about that whoever calls on the name of the Lord will be delivered” (2:32) – Jew or Gentile. NOTE: this another critical point in the text: in the last days (beginning with Pentecost/Acts 2 but accelerating as we get closer to the Day of the Lord), we’ll see the Holy Spirit moving more powerfully and publicly and personally and persistently than ever before in human history…..this requires us to develop a much better, deeper, richer Biblical understanding of the Holy Spirit’s role, how He works, how to be filled with the Spirit, how to walk in the Spirit, how to be careful not to grieve the Spirit, how to be more discerning of spiritual deception, etc. That said, the Lord will use these terrible judgments to shake people all over the world – and particularly in Israel – and cause Jews and Gentiles to deeply reconsider what they believe and what they are following. Many will come to faith in Jesus during these times. Whoever will repent, whoever will return to the Lord, whoever will call on the name of the Lord will be saved. Why not make that decision today, before these traumas come? Yes, Jews are the Chosen People. But according to the Scriptures, it is not enough that the Lord chose the Jews — Jews must also choose the Lord. Yes, God loves the Gentiles. But according to the Scriptures, it is not enough that the Lord loves Gentiles — Gentiles must also love the Lord with all the heart, soul, mind and strength, and love their neighbors as themselves. Now is the time to call on the name of the Lord and be saved. To read these and other columns on our new Hebrew blog, please visit www.joelrosenberg.co.il. To watch any of the messages on the Book of Joel from our recent conference in Jerusalem, please go to www.epicenterconference.com. 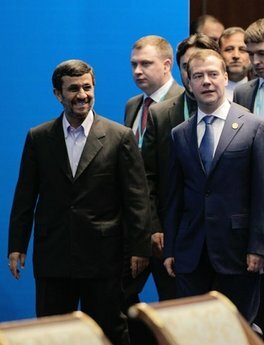 Iranian President Ahmadinejad and Russian President Medvedev meet at summit in Central Asia. >> Learn more about the “Wake Up Call” simulcast event that Anne Graham Lotz and Joel are teaching at on Sunday, September 11th — a call to prayer, fasting and repentance in light of Bible prophecy and current events — please get your family and church involved today. To learn more about the prophecies of Ezekiel 38-39 and the biblical “War of Gog and Magog,” please click here for Part One. 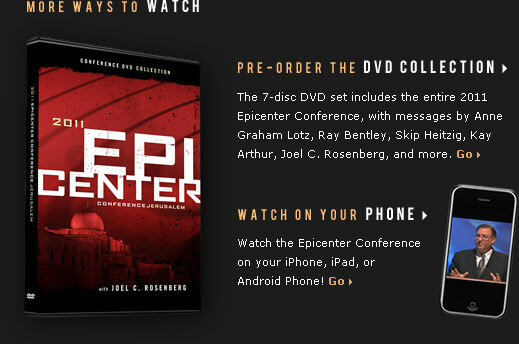 To watch the messages from the 2011 Epicenter Conference in Jerusalem online for free — or to purchase a set of the DVDs — please visit www.epicenterconference.com. To participate in the “Wake Up Call” event with Anne Graham Lotz and Joel C. Rosenberg, please click here. To learn more about — or financially contribute to — the work of The Joshua Fund to bless Israel and her neighbors, please visit www.joshuafund.net. In light of such disturbing trends, I am posting some of my notes covering chapter two of the “Book of Joel.” In his second chapter, the Hebrew prophet gives us so much vital information about the future of Israel and how to live in the last days that I won’t be able to cover it all in one posting. But I hope you will find these notes helpful as you study the writings of this important minor prophet and teach them to others. I would also encourage you to watch the message delivered at The Joshua Fund’s 2011 Epicenter Conference by Pastor Ray Bentley, who taught on Joel 2:1-17. In a few days, Lord willing, I will post my notes covering the rest of chapter two. We are to explain that the run up to the Day of the Lord will be traumatic — the land of Israel will suffer an invasion unlike anything in its history….the text indicates that the land of Israel will be completely overrun and will suffer serious devastation, far beyond the locust invasion that described in chapter one. What’s interesting is that in the first 24 verses of chapter two, the word “locust” is never mentioned. Rather, we have images that are similar to a classic locust invasion, but far more devastating. The Hebrew Prophet Joel describes Israel as being fully invaded and completely overrun by enemy forces, like a locust invasion; this is not, however, what is described in Ezekiel 38-39 where the enemy comes against the mountains of Israel but is then supernaturally destroyed, unable to completely invade and overrun the land. Joel describes the judgment of “all the nations” (3:2) occurring after the enemy is defeated, whereas Ezekiel describes a limited coalition of nations being judged during their defeat. Joel singles out Egypt for such severe judgment that the text says “Egypt will become a waste” (3:19), whereas mention of Egypt is noticeably absent from Ezekiel 38-39. Joel also singles out Edom for such severe judgment that the text says “Edom will become a desolate wilderness because of the violence done to the sons of Judah in whose land they have shed innocent blood” (3:19), whereas mention of Edom is noticeably absent from Ezekiel 38-39. Again, in a few days I will post the rest of my notes on Joel chapter two which gives us hope for the future and specific, practical suggestions for Israel and the Church on how to live in the last days. “It is time to wake up.” That was the message Anne Graham Lotz — the internationally renowned Bible teacher and daughter of evangelist Billy Graham — brought to the 700 people who attended the 2011 Epicenter Conference in Jerusalem in May and the more than 50,000 people from 113 countries around the world who have now watched part or all of the messages online at www.epicenterconference.com since the event ended. Anne taught chapter one of the Old Testament Book of Joel in a message entitled, “A Wake Up Call For Israel and the Church.” It was a powerful and challenging message and I would encourage you to watch it for free on-line or purchase the DVD package to watch with family, friends, and your church. As a follow up, I am pleased to announce that Anne Graham Lotz and I will host a special worldwide simulcast on Sunday, September 11th, 2011 called, “A Wake Up Call For God’s People.” I will teach on Bible prophecies and current events that indicate that we are getting closer and closer to the return of our Lord Jesus Christ. Anne will teach from the Scriptures on how we are to get our hearts ready to know God personally, have our sins forgiven, be living lives of purpose and impact, and to truly be ready for “the Day of the Lord.” If you are a pastor, please visit our special webpage, learn more the event, and sign up to show the simulcast to your congregation at 7pm eastern this 9/11, or 6pm mountain and pacific time. If you are a lay person, please ask your pastor to show the simulcast to your congregation as a way of remembering the events of September 11th to turn our hearts back to the Lord. That said, the other day I posted my notes of an overview of the Book of Joel. Today I am posting my notes of my own personal study of Joel chapter one. I hope you will find them helpful as you study the writings of this important minor prophet and teach them to others. The Lord is saying through Joel that the devastation that has been wrought foreshadows a future apocalyptic disaster coming to Israel in the End Times. Locust plagues are classic forms of God’s judgment in Scripture, both in times past and in End Times prophecies yet to be fulfilled. The question is: Will we wake up? Do we see how far we are from the God who made us and loves us and is jealous for our love and affection? Do we realize how drunk we are — with alcohol, with illegal drugs, with legal drugs, with entertainment, with the “things of this world”? Do we realize how blind, deaf and dumb we are to what the Lord is trying to say to us through His Word? Do we realize that if we don’t turn around quickly, the Lord is going to come and rock our world, shake our world, devastate our world, until we choose to curse Him, or until we choose to fall at His feet and give Him the worship He so richly deserves? I hope this is helpful. Next, I will post my notes from Joel chapter two. For Part 1 of this series on the Book of Joel, please click here. A growing number of Muslims, Jews and Christians believe we are living in the last days of human history as we have known it. Are they right? Are the tumultuous events and trends underway in the Middle East and around the world signs that the Messiah is coming to Earth soon to judge and to rule and reign from Jerusalem? What is the “Day of the Lord”? What are the “last days”? What does Bible prophecy teach about such things? And how should we live in light of such prophecies? Answering these questions was the focus of the 2011 Epicenter Conference, which took place in Jerusalem on May 15-16. On Day One, a group of internationally renowned Bible teachers and I taught through the Old Testament “Book of Joel” verse by verse, chapter by chapter. We then had a panel discussion on lessons for Israel and the Church drawn from the Book of Joel. On Day Two, we had a series of panels where highly-regarded Israeli, Palestinian, American, Iranian and Indian pastors and Bible teachers explored the implications of these Bible prophecies for Israel and the Church in more depth in light of current events. By God’s grace and to our great encouragement, some 700 evangelical Christians — including those from as far away as Uganda, Ghana, Germany, South Korea and South Africa — attended the The Joshua Fund’s annual conference in person. Since then, more than 50,000 people from 113 countries around the world have watched videos of the messages on-line at no charge at www.epicenterconference.com. Many have also pre-ordered a complete set of the messages on DVD so they can watch them with — or give them to — family members, friends, their small group Bible studies, home fellowship groups, or their whole church congregations. I believe God wants all of Israel and all of the Church to turn our attention to the Book of Joel in the weeks and months ahead. There is a critically important message there that is on the Lord’s heart and it is deeply relevant for our time. Over the next few days, I’m going to share with you my own personal study and message notes from the Book of Joel. I hope you will find them helpful as you study the writings of this important minor prophet and teach them to others. Let’s begin today with an overview. What follows are the notes I used to deliver the first message of the 2011 Epicenter Conference. The focus of this year’s Epicenter Conference is the Book of Joel. Today, we will go through the Book of Joel verse by verse, chapter by chapter. We’ll observe, interpret and begin to apply. What does this fascinating ancient text say? What does it mean? And what does it mean to you and I today whether we live in Israel or anywhere else around the world? Tomorrow, we will take the next step. We’ll explore a range of threats facing Israel and her neighbors and consider these threats – and how to respond to them – in light of what we learn from the Book of Joel and the rest of the Holy Scriptures. The question that might reasonably be asked is, “Why?” Joel is not a particularly popular book of the Bible. Some pastors refer to it. Some teach through it. But most don’t. Why, then, should we? It’s a good question and one I’d like to address before we dive in with our blessed line up of internationally renowned Bible teachers. Let me start by saying it’s not because it’s my favorite book of the book, though it is and it has been since I was in high school — and yet I have never taught the Book of Joel before today or ever attended a church or conference where I heard it taught cover to cover. And it’s not because my friend, Pastor Ray Bentley, called me one day a few years ago and said we really need to have an Epicenter Conference that teaches through the Book of Joel, though he did, and I thought He was right, and have been praying about it ever since. All these are contributing factors. But the reason is more simple and far more profound: the Lord told us to proclaim in 2011 in the message He proclaimed through the Prophet Joel thousands of years ago, and we are being obedient to that heavenly command. There is a message here that is relevant for our time. There are warnings here that we dare not ignore. There is a sense of urgency in the heavenlies we need to share. This is a book that is near and dear to the heart of the Father…there is a fallen world that is not listening…and a Church that by and large is not proclaiming. May we purpose in our hearts today to change course while we still can. We don’t learn much about the life and ministry of the Prophet Joel in this book or anywhere else in the Bible. Why? Because the Book of Joel isn’t about Joel – it’s about the coming of the Day of the Lord and God’s call on Israel and all men and women everywhere to repent, turn away from their sins, and get ready to meet the Lord face to face, before it is too late. WHAT: This small book of the Bible (three chapters in English; four chapters in Hebrew) is a book of End Times prophecy. The Lord speaks to Israel, to the Church, and to all the nations through the Hebrew Prophet Joel, telling us details about the future and sharing His heart that all men and women everywhere would choose to turn to the Lord and let Him change and restore our lives. WHEN: Unlike many other books in the Bible, the Book of Joel provides us with no clear, definitive time references regarding when it was written. Some scholars say around in the 9th century B.C. Some say 6th or 7th century B.C. Some say in the 5th century, B.C. To serve as a “wake up call” to the people of Israel, Judah and Jerusalem to prepare for and repent ahead of the coming “Day of the Lord,” judgments that would be similar to but far worse than the devastating plague of locusts Israel once experienced. To serve as a warning to the nations that in the Day of the Lord they will face judgment for sins they have committed against Israel and the Jewish people. What is the “Day of the Lord” and is it different from the “last days”? The “last days” is the Biblical term describing the period of time filled with prophetic events of signs and wonders that lead up to the Rapture of the Church, the period between the Rapture and the Tribulation, and the Tribulation itself, all of which build towards the Second Coming. The last days – characterized by wars, rumors of wars, revolutions, natural disasters, the rise of false messiahs/prophets/teachers, apostasy, lawlessness, persecution of the believers, the spread of the gospel to all nations, the rebirth of Israel, and similar signs described in the Bible – are a time of great trauma for the world as well as God’s mercy, for the Bible indicates that many will come to faith in Jesus Christ during the last days. The “Day of the Lord” is the Biblical term describing the culmination of the last days of world history as we have known it — specifically, it refers to the actual, physical, literal Second Coming of the Lord Jesus Christ. This is the time when Jesus Christ wins the Battle of Armageddon and the Battle of Jerusalem and then His feet literally touch down on the Mount of Olives, splitting the mountain into two, as foretold by the Prophet Zechariah. The Day of the Lord is described throughout the Scriptures as a day of darkness, gloom, distress and judgment for the nations. The Day of the Lord sets into motion the setting up of the MillennialKingdomin which Jesus Christ will reign from a new Temple in Jerusalemfor a literal 1,000 year period, as described in the Book of Revelation. Next time, I will post my notes for Joel chapter one.